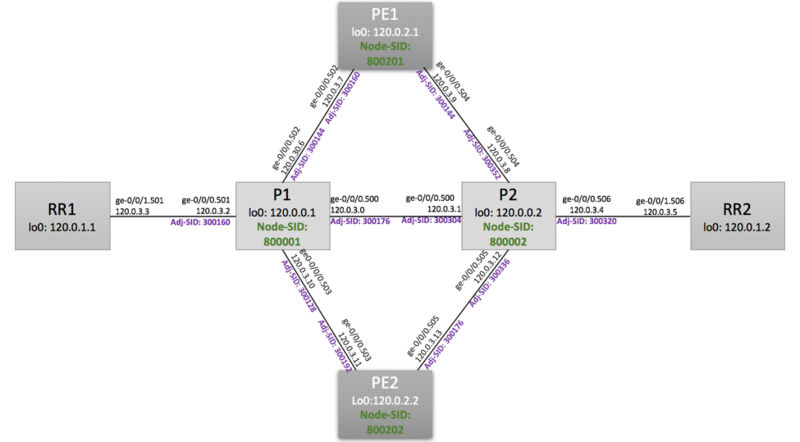 Step-by-step migration from LDP-based design to Segment Routing topology in Juniper environment. In this example, we will be using IS-IS as IGP protocol. Today, we’ll perform step-by-step migration of MPLS network from LDP to Segment Routing. Our starting point is the logical topology depicted below. 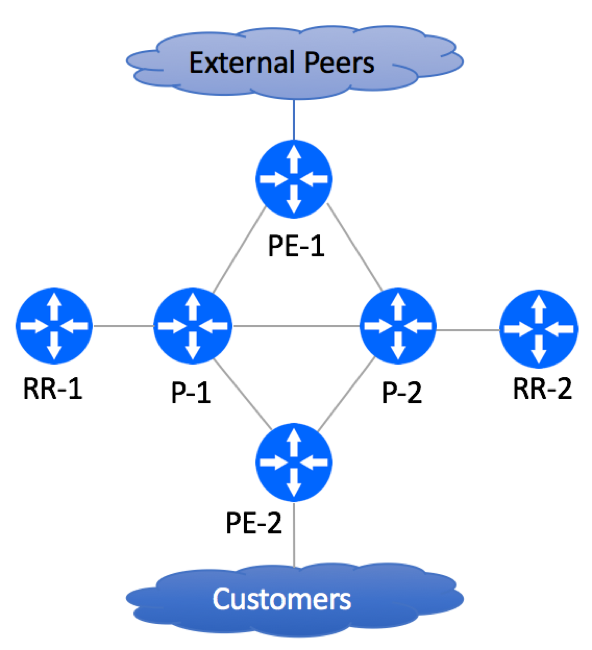 It represents a typical Service Provider Network with two PE nodes, two P nodes, and two dedicated Route-Reflectors. We are using JunOS version 17.1. MPLS and IGP topologies are shown below. IS-IS is used as IGP Routing protocol. 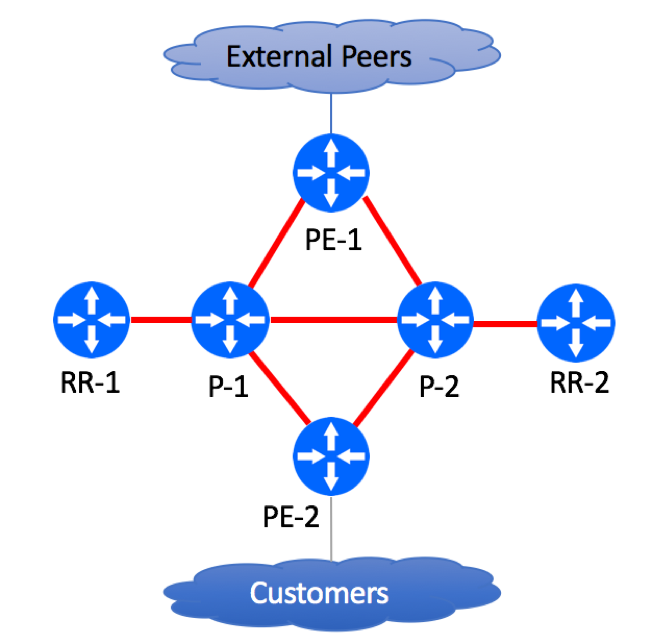 All customer routes, including PE-CE point-to-point prefixes, are carried over IBGP. MPLS Forwarding Tables are populated with LDP-originated LDP labels. Basic SR configuration is very simple. In fact, it is easier to enable SR than it is to configure LDP. All you need to do is to allow ‘source-packet-routing’ under protocol IS-IS and specify unique node identifier for each SR-enabled device. After completing configuration, Node-SIDs (global significance) and Adjacency-SIDs (local significance) will be advertised via IS-IS. Please note that SR was not enabled on Route-Reflectors, so there are no SIDs associated with RR links and nodes. On one of the nodes, verify IS-IS database to make sure that SPRING sub-TLVs have been propagated. MPLS Label for a given Global-SID will be calculated as SID Label Value (800,000) plus Node SID Index. Now you can verify if inet.3 table got populated with SR routes for Spring-enabled devices. Indeed, we now have routes originated via ‘L-ISIS’. The routes are not yet being used, as LDP’s Protocol Preference of 9 wins over SR’s preference of 14. Now that SR topology is fully configured, you can either completely deactivate LDP or change LDP’s Protocol Preference to make it inferior to SR’s preference. This would force transit traffic to switch from LDP to SR LSPs. There is no need to add Segment Routing-specific terms, as SR Updates are carried in IS-IS messages.